Ink Spells Can’t Wait for The Red Pyramid! 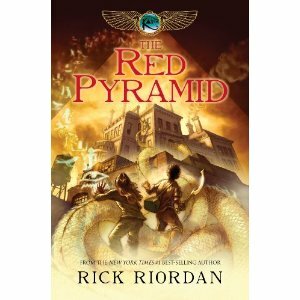 Fans of Rick Riordan’s The Lightning Thief will be excited to learn he’s starting a new series (The Kane Chronicles) with Book 1: The Red Pyramid, to be released May 4th, 2010. Dark Omen and Worm Burner both read and loved the entire Percy Jackson series, and are eagerly awaiting the new book, where Riordan tackles another ancient mythology: Egyptian gods. I really can’t love Riordan any more than I do for bringing ancient peoples alive for the middle grade set. Plus, the man is flat out funny. We also saw The Lightning Thief movie, and one of my chief complaints (although we still immensely enjoyed it) was that it lacked the humor of the books. I hope Riordan will bring his irreverent pitch-perfect-for-middle-grade humor to The Red Pyramid, where siblings Sadie and Carter battle ancient Egyptian God Set in a dangerous journey across the globe to uncover the truth about their family, and their father who has managed to get himself banished to oblivion. Interestingly, Hyperion Books has decided to release the hardcover ($10.52) version and the Kindle ($9.99) version at the same time. I would love to purchase the e-book, to save a couple bucks, and because both boys are eager to read on the nook. Sadly, only the Kindle version is available. This dogged war over e-book pricing (which in this case at least is less than the hardback), and not making books available in a wide range of e-formats, frustrates me. I preferentially buy B&N, trying to keep the paper book store afloat, but I will buy the hardback from Amazon this time (eventhough the pricing is identical), just because they tried to make e-books available. Or perhaps they will lose my sale altogether, and I’ll see if the library will carry it sometime soon. Unless Dark Omen wants to add The Red Pyramid to the small library growing inside his closet, there’s no need for us to purchase the book, but I would have gladly purchased if it was in e-book format. Soon and very soon, I hope the publishing industry realizes that they need to embrace e-books as their salvation, not their doom. In any event, we will read The Red Pyramid, one way or the other. My preference would be to pay Rick Riordan for the pleasure. Oooh! I'm so excited for these too. I love his irreverent humor and his weaving of mythology in. But surprisingly, I haven't seen the movie yet–I heard it was nothing like the books so I haven't bothered yet. Thanks for the update, Susan! First, kudos to Riordan for bringing rich history to his stories and audience. Secondly, I think you are the first person I've seen to suggest e-books as publishing's salvation. They reallyl dug their heels in on that one didn't they. And I think you very well may be right! @Joanne I know I'm a lone voice, probably resembling a crazy person, but I'm looking at this from a free-market and reader perspective – which I think is important if you want to have any hope of seeing into the future. Colleen Lindsay passed around this amazing (and hideously long but very worthwhile) video about e-books, the market, and pricing. This is interesting–we used to be concerned (and rightly so) about the survival of indie bookstores and now we're worried about the chains! @Carl That's definitely an interesting e-book article, and sums up much of what I've heard. There's this very long, but very interesting, video on the e-book market (and yes, I'm a tech immigrant! ), and this pontification on the true worth of an e-book. Lots of different angles to this discussion, which just makes it more interesting.